Our President warmly welcomed all the ladies to the start of another new year of Annalong WI. We welcomed Edwina Marr our Federation Vice Chairman along with the tellers Anne and Florence for the evenings AGM. 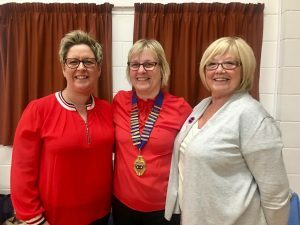 Olive thanked the outgoing committee and handed the evening over to Edwina whose enthusiasm was shining from her, she showed her appreciation for our large membership and the Annalong Sea Air which keeps us all glowing. All offices were declared vacant and the voting list read, and voting took place for our new year’s committee. Our AGM consisted of minutes from last year’s AGM and an annual report and financial statement read by Lorna and Iris. Edwina followed with the financial rules for the WI. Olive discussed our program for the incoming year and everyone enjoyed the super provided. After super the new committee was announced and they are as follows: – Olive Hanna, Sylvia Newell, Lorna Sloan, Iris Gordon, Mary Burns, Charlotte Campbell, Edith Edgar, Patricia Holman, Georgina Rooney & Evelyn Trimble. Our Birthday girl was Linda and anniversary girl was Olive H. the raffle was won by Liz H, Dorothy and Jean McC. Our next meeting will be held In Annalong Community Centre on Thursday 4th October at 7:30pm when we will be joined by Jenny Hanna from “The Green”. All new members will be made most welcome.